This morning's satellite picture (below) shows a low pressure area off the coast moving eastward and another system developing in the Gulf of Alaska. Moderate to heavy precipitation will occur through mid afternoon with snow levels dropping to around 4000 to 5000 feet. Tonight through midday Sunday there will be showers with snow levels 3500 to 4500 feet. Sunday afternoon and Monday the next storm system will move through. This is a much colder system and will bring rain to all of the north state. Snow levels will drop by Monday to 1000 to 1500 feet in the north and 2500 to 3500 feet in the south. The precipitation will turn to showers by Monday night and will end by Tuesday morning. Skies will be clearing Tuesday and remain mostly clear through Thursday. However, the airmass over the north state will be cold and very cold temperatures are expected Tuesday and Wednesday nights. The next system approaches the coast late Thursday (see map below). This system will bring more rain to our area Friday and early Saturday. 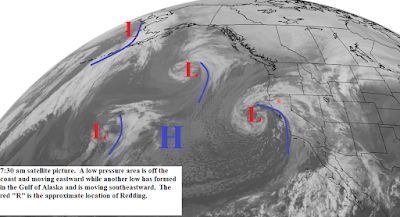 Snow levels will be quite low from Redding northward due to trapped cold air.